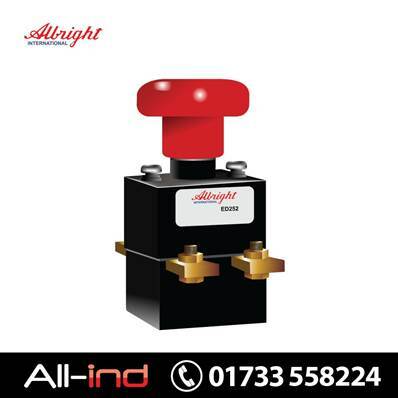 The ED range of switches have been designed to provide a rapid means of disconnecting batteries or other power supplies in the event of serious electrical faults. Whilst the switches are primarily intended for use with battery powered vehicles they are also suitable for use with static power systems. All types are capable of safely rupturing full load battery currents in the event of an emergency. Lockable versions feature a key which is necessary for the knob to be moved from the off position to the on position. The switch is fully serviceable with genuine replacement parts available. Precautions: the switch is to be used to rupture current in an emergency or as a no-load isolator, do not use as a regular on-load switching device. Continuing innovation in new products keeps Albright out in front when it comes to heavy duty contactors. They have an unrivalled level of quality, custom products at very competitive prices.